Bariatric surgery of any kind is a decision that is not made lightly by any prospective patient. There is much to consider in terms of whether surgery overall makes the most sense for your particular situation and, if so, which weight loss surgery will offer you the best potential for success with the lowest risk. No matter what you choose, it’s a big commitment – a commitment to the surgery itself and a commitment to a new lifestyle following the surgery. There are many reasons that patients choose Laparoscopic banding, or the LAP-BAND® procedure – not the least of which is the fact that this is the only bariatric surgery available in the United States that is both adjustable and completely reversible. The objective of the LAP-BAND® surgery is to reduce the capacity of the stomach – thus significantly reducing the amount of food that can be eaten by way of restriction. The restrictive tool in this case is the LAP-BAND®/REALIZE™ Band. 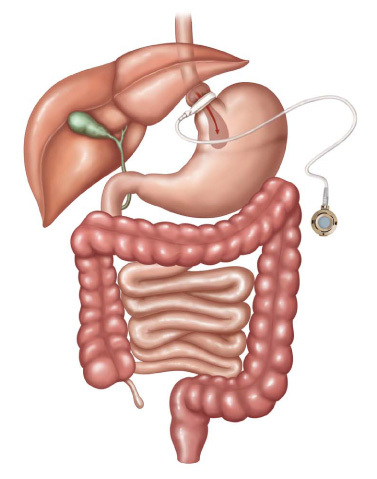 During laparoscopic surgery, the band is fastened around the stomach, leaving the patient with a smaller stomach pouch. The result is two-fold; there is now a much smaller limit on the amount of food that can be consumed comfortably and the reduced stomach size causes the patient to feel fuller much faster. The goal is that the patient will ultimately feel satiated with smaller amounts of food and the reduction in calorie intake will naturally result in weight loss. The LAP-BAND® Surgery is laparoscopic which means that there is no cutting, stapling, or intestinal rerouting that is necessary. This less invasive type of surgery means less pain post-operatively and a faster recovery and return to normal activities. For these reasons, the LAP-BAND® Surgery is considered the least traumatic and lowest risk of the weight loss surgery options. In addition, the LAP-BAND®/REALIZE™ Band is adjustable which means that it is a versatile option for patients in a variety of situations. The band can be tightened to better help you realize your weight loss goals, or loosened if additional calories are required, such as during a pregnancy. The flexibility of this particular procedure is certainly one of its attractive features for many people considering weight loss surgery. If you have any questions about the LAP-BAND®/REALIZE™ Band, LAP-BAND® Surgery, or any weight loss surgeries, please contact us today at the Nicholson Clinic for Weight Loss Surgery. We’re happy to help you determine if bariatric surgery is right for you. *Journal of American Medical Association, The Current State of the Evidence for Bariatric Surgery, 2014.